It seems a lot of people don’t. Do you? Well, I do. Get a lot of it. Enjoy it. What do I mean by the fine print? The small, small words printed on so many things that we buy. Prepared foods. Of course it had fine print and I found it. Medications. Publications. Products. Name it and it probably has fine print. Now you may be wondering, why do they make it so small? Good question. I’m speculating. Maybe they don’t want us to read it. Maybe a law compels them to print whatever it says. Maybe for our protection and safety. Maybe for their protection. Maybe for whatever reason. But whatever the fine print says, often, as I said, I learn something. I am so darn curious. It seems strange maybe, but often I do have fun reading it. I just bought a package of razor blades at Dollar Tree. As you know, everything they sell is $1. Seems so crazy. I don’t know of any other retailer that does that. Do you? Dollar Tree was born doing that some 30 years ago. When they had only one store. Now there are 14,835 Dollar Trees in the USA and Canada. And 176,000 employees. By selling just $1 stuff, they will rake in more than $22 billion this year. They are a Fortune 150 company. Imagine that! Well, I found they offered six different kinds of razor blades. Some for men and some for women. Some with two blades per razor, some with four, some with six. Other features also. Of course, some packages contained more razors than others. I believe Dollar Tree sells good stuff. No junk. It’s a basic policy for them. If you don’t like it, bring it back for a refund. Our Dollar Tree in Morro Bay is small, as most are, but it does big business. And they honor that guarantee. No wonder their stores are so popular. I selected a package that said, “Ten Count / Unites.” Unites is the French word for saying the same thing as “count.” Must mention there was an acute accent on the “e” in Unites, but sorry, on my computer I don’t know how to insert an acute accent. So yes, 10 razor blades—just 10 cents apiece. I use one once, then chuck it. Hey, sometimes I get to use one twice. Whoopee! The brand was called Assured. The plastic bag was attractive. There was a “window” in it so you could actually see the working end of a razor. They were made of blue plastic. I noticed the women’s model was pink plastic. In smaller type, it said “Lubricating Strip.” You know, it makes the razor glide over your skin. What’s this with the French? Why French? Simple. Remember, Dollar Tree has stores in Canada. Many French-speaking people up there. In fact, Canada has two official languages, French and English. That’s why Dollar Tree uses French and English on all its packaging. It has to. Now for the fine print. After all, that’s why I’m writing this. I found 12 lines of it. The print was smaller even than the small print newspapers routinely use. First, the name of the importer of these razor blades, Greenbrier International Inc. and its offices, one in Chesapeake, Washington, and the other in Barnaby, British Columbia. So truly it’s an international company. The bottom line: They would be sold in the U.S. and Canada. The next fine print was the most interesting of all. Those tiny twin blades were made in South Korea! But the razors were assembled and packaged in Mexico! From that I jumped to the conclusion that if packaged in Mexico, then the plastic bags are manufactured in Mexico. But maybe not. Maybe from the U.S. or China or Timbuktu! I also wondered, why aren’t these razors also sold in Mexico? After all, there are millions of Mexicans and they’re right next door to us. Maybe they are sold down there. Mexico’s only language is Spanish, so I would think all the words on the package would be in Spanish. Getting back to Greenbrier International, maybe it also imports a lot of other merchandise for Dollar Tree. After all, Dollar Tree stocks its stores with hundreds of items. Many from China, as we know. Some from Bangladesh and India and many other countries. I’ve read that Dollar Tree buyers scour the world for items that it can sell for just $1. Which raises an interesting point. Yes, the company was started some 30 years ago. From its very start, as I’ve mentioned, every item was just $1. In 30 years there’s been a lot of inflation. How has the company coped? Several ways. In some cases, they’ve found manufacturers in cheaper countries. In many cases, by selling fewer items—razor blades, let’s say—per package, or ounces per bottle or container. In some cases, by dropping some items from their inventory. For instance, I’ve noticed they now sell far fewer kinds of tools than years ago. In fact, the tool department is smaller. Now about Greenbrier International. Maybe it’s an affiliate of Dollar Tree, or a division of it. Or maybe Greenbrier is a company unto itself and also imports stuff for other retailers, maybe even giants like Walmart and Amazon. Another interesting question to me is, how many packages of razor blades does it sell per year? Is it a million? Could be. That would mean taking in$1,000,000! 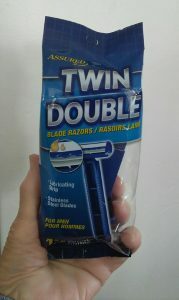 So how many men and women shave with Dollar Tree razors regularly? I’ll bet Dollar Tree knows. So, the next question is, how many pennies of profit will Dollar Tree make on each package of razors? Will it be the same amount on my package of 10 as on the package of six? Four? Two? Maybe yes, maybe no. How much will Greenbrier make? How much will the South Korean manufacturer of the steel blades? The Mexican company doing the assembling and packaging? How much will the companies transporting all those raw materials to Mexico and then the finished razors to the U.S. and Mexico? And finally getting them to those thousands of stores? One other thought. Dollar Tree is very savvy. Very sophisticated. I wouldn’t be surprised if it stocks some items with zero profit. Zilch. Maybe even at a loss — as “loss leaders,” so called. Because Dollar Tree believes the terrific PR of it—convincing us it indeed sells real bargains — is all-important. It’s our believing that which makes its stores so popular. 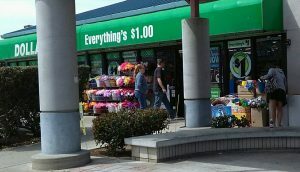 Here in my little Morro Bay, Calif., I believe that Dollar Tree is the most popular store in town after our three food supermarkets. I have no solid data but I’ll bet I’m right. Maybe even more popular than one or two of our food supermarkets. Dollar Tree in many ways is remarkable. By the variety of the products it offers, by the huge restocking that it does routinely to maximize sales for Mothers’ Day, The Fourth of July, the Graduation Season, Thanksgiving, Halloween, Christmas, New Year’s, and so on. Other retailers do that, sure, but not so intensely. Oh, this may surprise you. Dollar Tree also sells online. Yes, to individuals, groups, anybody who wants to buy in larger quantities. For instance, a school teacher for her classroom. Maybe you love their nugget pretzels but your store often runs out. Well, stock up online. As you can see, Dollar Tree’s story is an incredibly interesting one. To me, a fascinating one. Now the final question. As inflation continues, as it’s expected to, how long can Dollar Tree maintain that crucial $1 strategy? The day will come when Dollar Tree will have to re-brand itself. To Double Dollar Tree or something like that. Or surely it will go out of business. That would be bad news for fans aplenty. That’s happened to other famous chain stores. Montgomery Ward died. It seems Sears—for a long time famous as Sears Roebuck–is dying now. Same story with A & P supermarkets. And numerous other popular brands. Now about reading fine print once again. If you, too, read it, great! If not, maybe you’ll give it a closer look now. To me Dollar Tree’s story is all part of the great saga — the great success — of capitalism and free enterprise. How it serves both sellers and buyers. Both sides. Which is one of the things that make us so fortunate to be living in the good old USA. And notice, please, I didn’t write that in fine print. I put it in bold. It deserves to be put in bold. As always, I look forward to your comments. I read them all. Enjoy them, whatever you say. Especially when you also tell me a little about yourself.